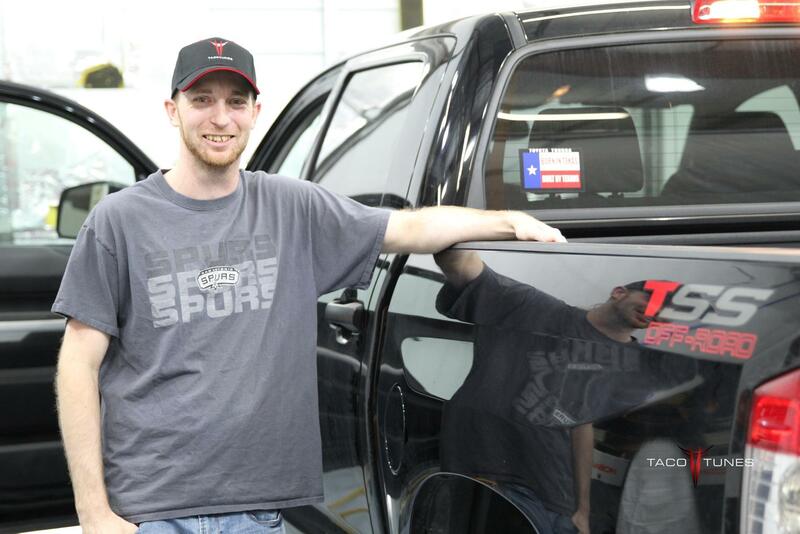 For the last 10 years we have been installing systems in Toyota Tundras here in San Antonio. 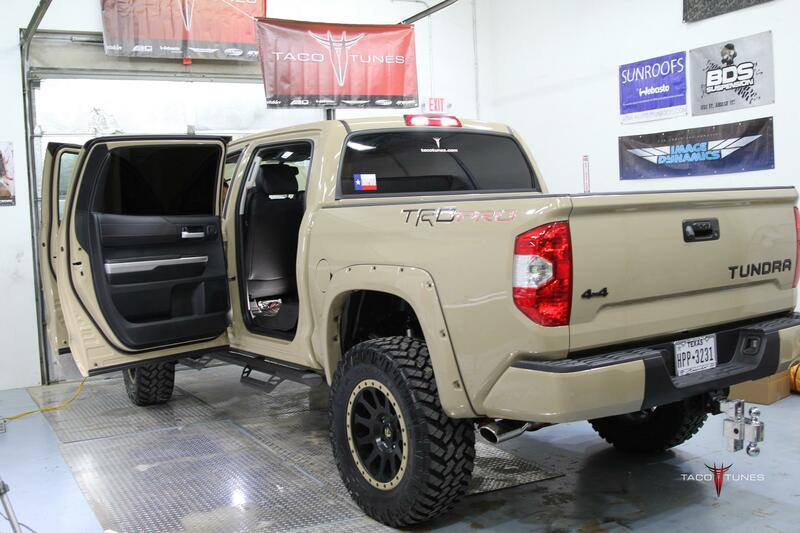 This package includes everything you will need to install a system in your Toyota Tundra CrewMax. NOTE: This harness system will utilize your stock wring. You will NOT need to run new speaker wire to each door. 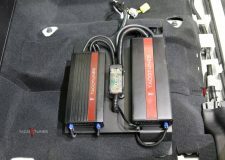 In addition, the harness system connects directly to your your new TXD plug and play amps. 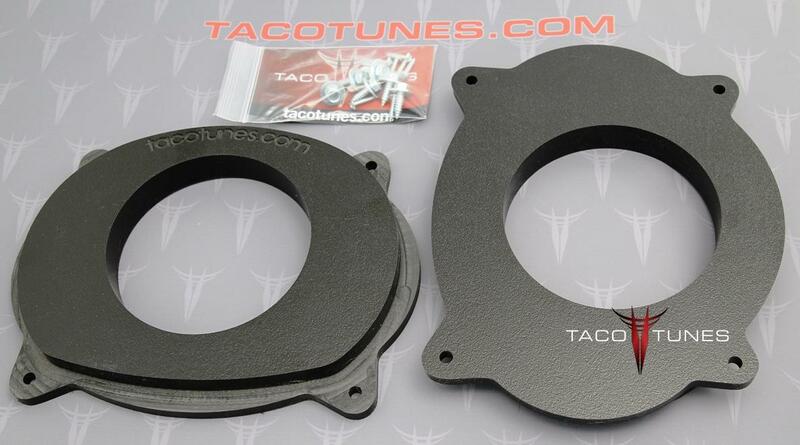 These tweeters fit in the stock door location (rear) with very little modification. They slide directly into the existing tweeter location. 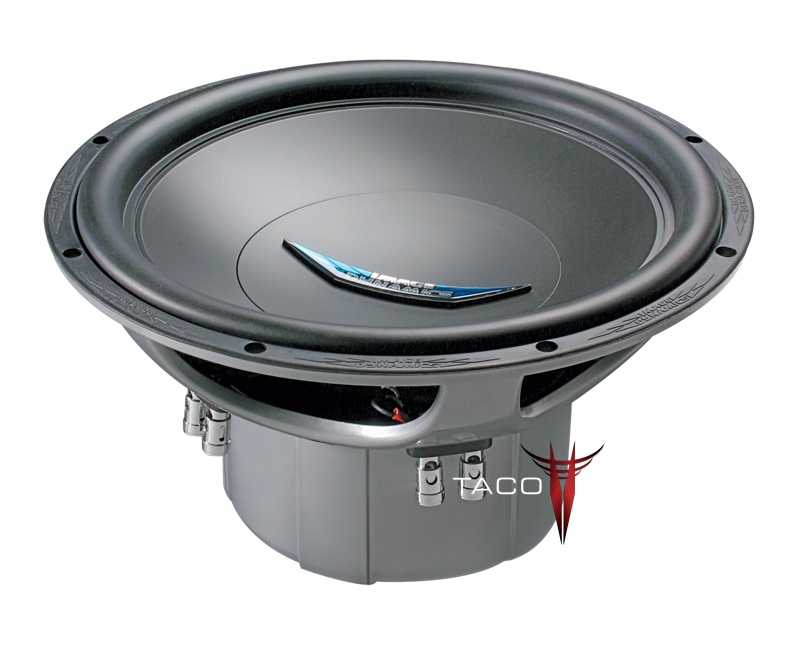 NOTE: For you megabass heads that want a lot of SPL and willing to give up some SQ, we have a dual 12″ subwoofer with full size Image Dynamics ID12s. 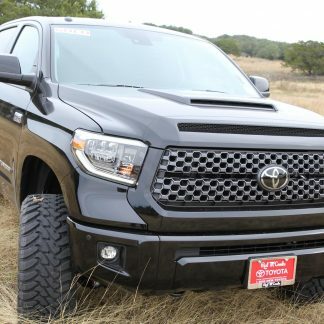 Be sure to check out our videos on selecting subwoofers for your Toyota Tundra. 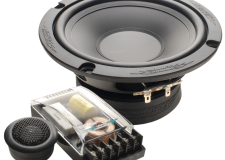 When you are installing an amplifier you will need a kit that includes a number of parts to get the job done right. We provide the following items to get the job done right. NOTE: ReCurve will be mounted under rear driver side seat. 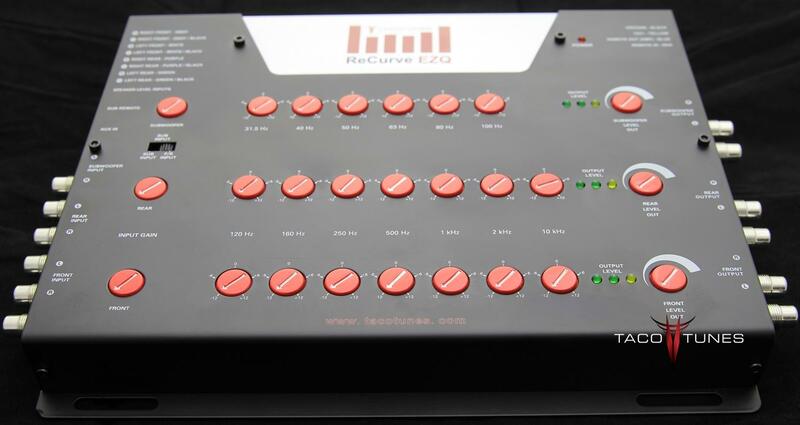 NOTE: ReCurve will be mounted under passenger seat above plug and play amps. Don't be afraid to jump in and do it yourself! 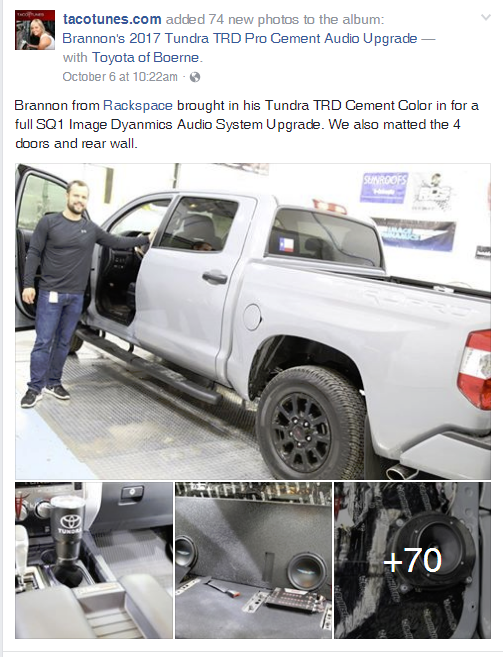 I was interested in a full upgrade for my Tundra Crewmax and decided on the SQ1 package. 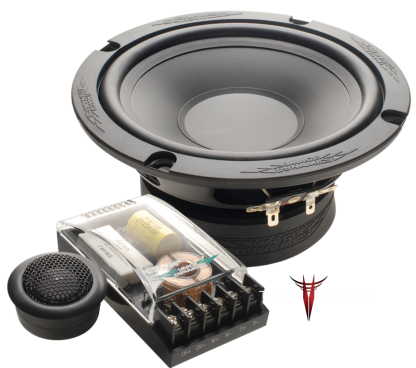 I have some basic experience with car audio but had never done door speakers or tapped into an existing head unit. I am also not a fan of heavily modifying my vehicle and would prefer to have the option of returning it to stock form if need be. 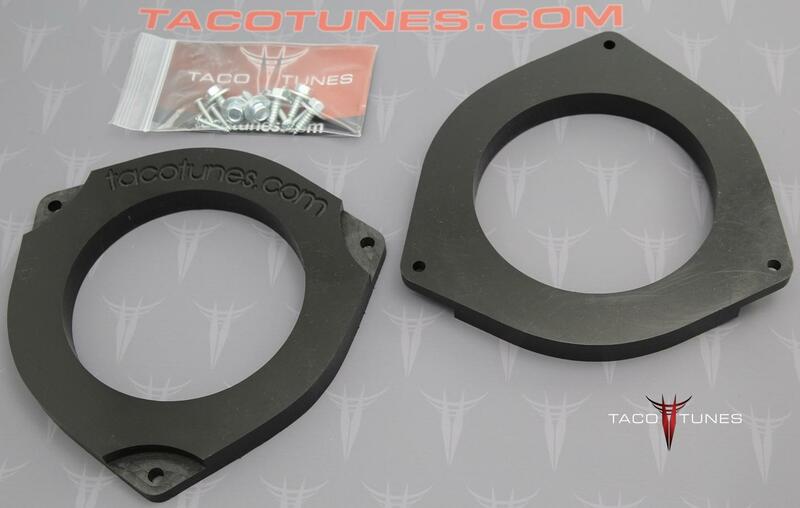 TacoTunes had the solution that I needed. First off, if you are planning your first DIY installation like this, it is not as easy as you might think. Thankfully, this company has devoted a lot of time, and probably money, to their instructional videos. These videos alone are worth any amount of money that might be saved by shopping around elsewhere. They were not 100% accurate for my application, but got me 95% there. Secondly, I was never without support. They make themselves available via text, email, chat, facebook, or phone…even the owner. The final product, once it’s all tuned, sounds amazing. All factory head unit functionality remains intact, which is a major plus in my opinion. 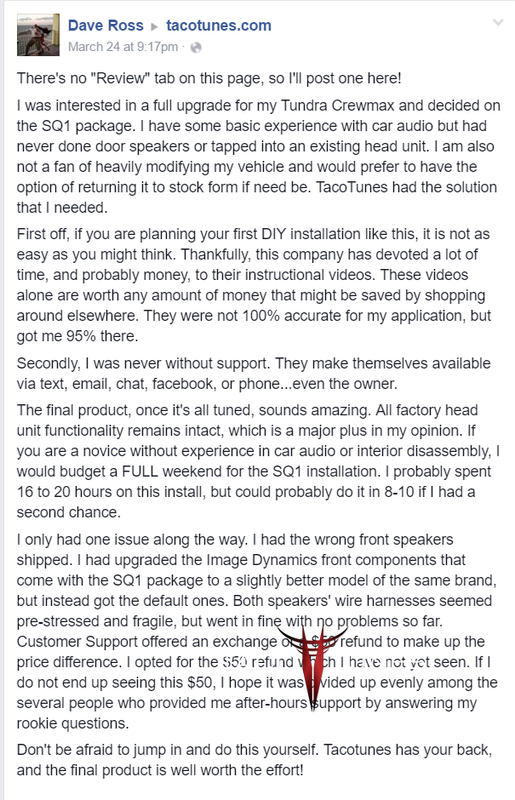 If you are a novice without experience in car audio or interior disassembly, I would budget a FULL weekend for the SQ1 installation. I probably spent 16 to 20 hours on this install, but could probably do it in 8-10 if I had a second chance. I only had one issue along the way. I had the wrong front speakers shipped. I had upgraded the Image Dynamics front components that come with the SQ1 package to a slightly better model of the same brand, but instead got the default ones. Both speakers’ wire harnesses seemed pre-stressed and fragile, but went in fine with no problems so far. Customer Support offered an exchange or a $50 refund to make up the price difference. I opted for the $50 refund which I have not yet seen. If I do not end up seeing this $50, I hope it was divided up evenly among the several people who provided me after-hours support by answering my rookie questions. Don’t be afraid to jump in and do this yourself. 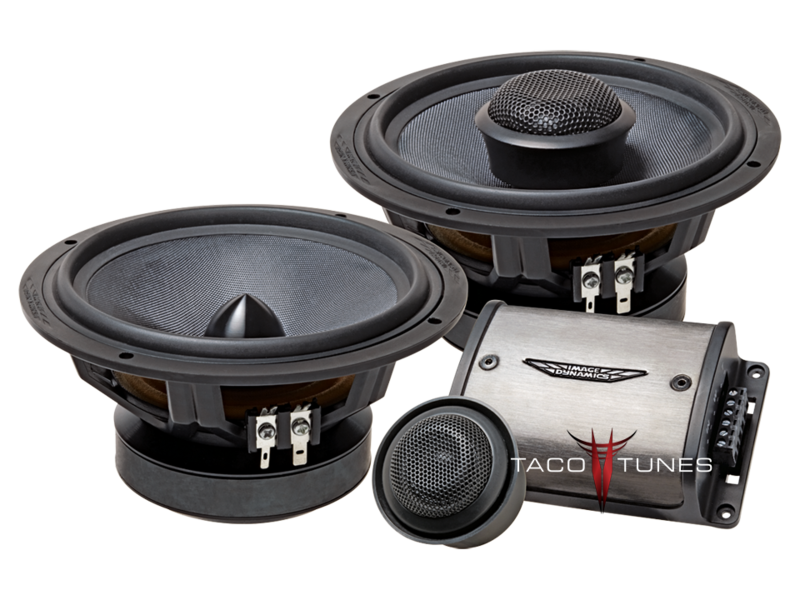 Tacotunes has your back, and the final product is well worth the effort! I love my new system. Never had a system this good in any of my past vehicles. We hit a snag first day, I came back and they fixed me up. I came back later for their big battery upgrade. 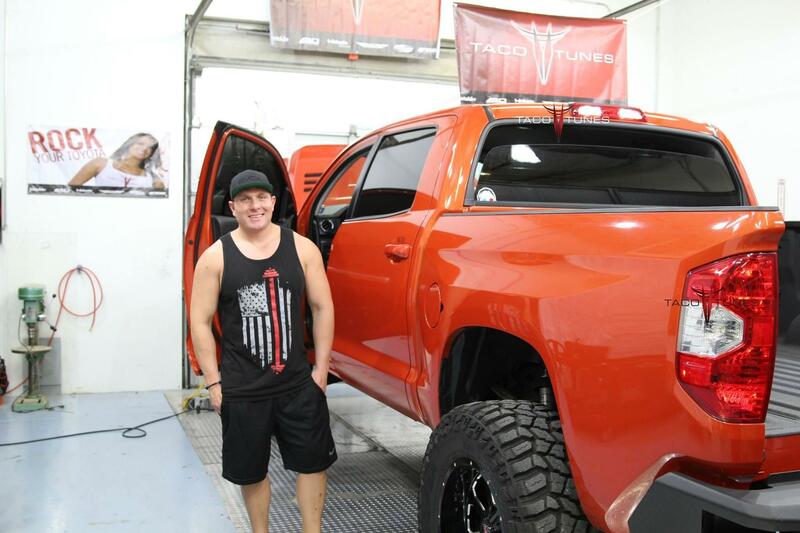 I had a great experience with Rob and the guys at Tacotunes. I had gone and gotten a system installed the day after buying my truck. But it was missing something. So I searched the web and kept hearing about this company. When I found out they were here in San Antonio I went and sought them out. They showed me what different packages they offered. 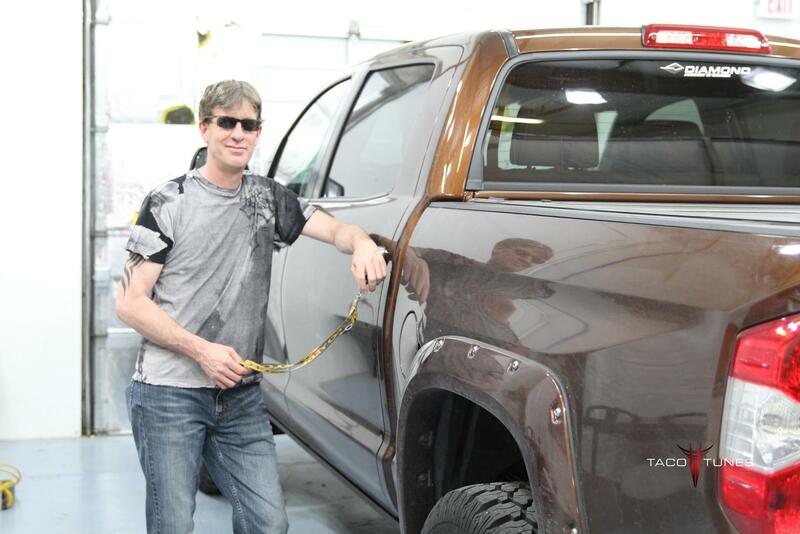 And I was blown away by the sound of Rob’s truck. I knew then. That that’s what I wanted. So sure enough I got them to hook me up! 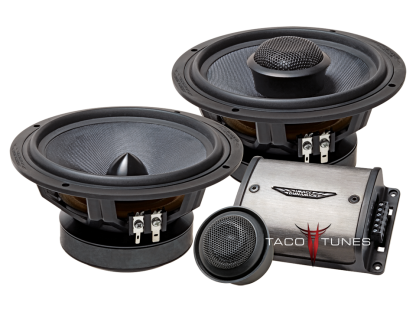 I’d definitely recommend them to anyone looking to step up there audio game. They really know what they are doing. 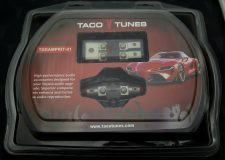 Taco Tunes are Rock Stars! Rob and his entire staff are nothing short of rock stars. I brought my truck in to have them put in a complete sound system. 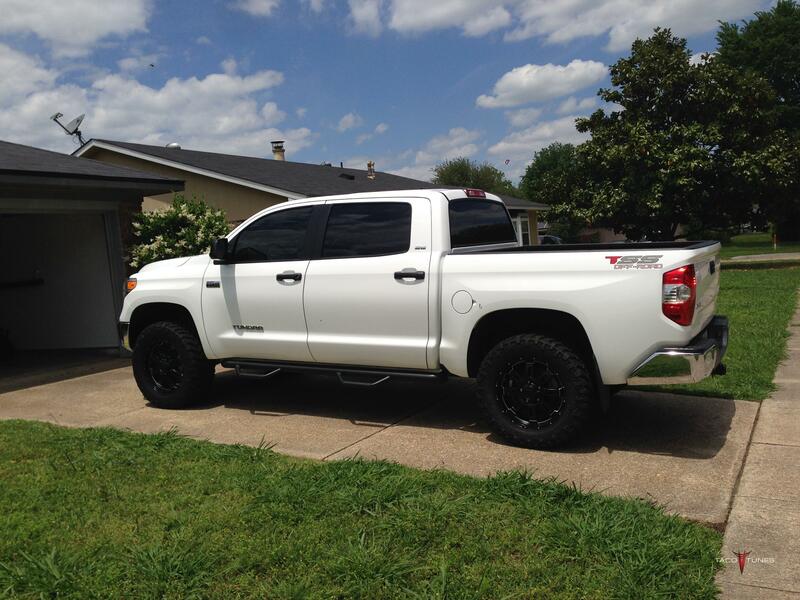 I actually had some work done to my sound system on my 2015 Toyota tundra by another shop. It was apparent shortly after that install that the system was not done correctly. When I brought it to Rob, he confirmed what I thought. In fact, after seeing photos of the installation process from Rob and TacoTunes removing my old amp and wiring, it was no wonder it sounded horrible. Rob told me that my truck was the worse he had seen from this particular shop. It was so bad, that Rob and his crew had to create a new harness to connect to my factory amp. I had them install the SQ1 complete package with the matting. I am so glad I pulled the trigger. 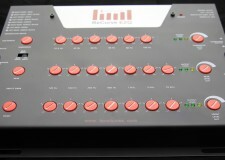 It sounds AMAZING!!!!! 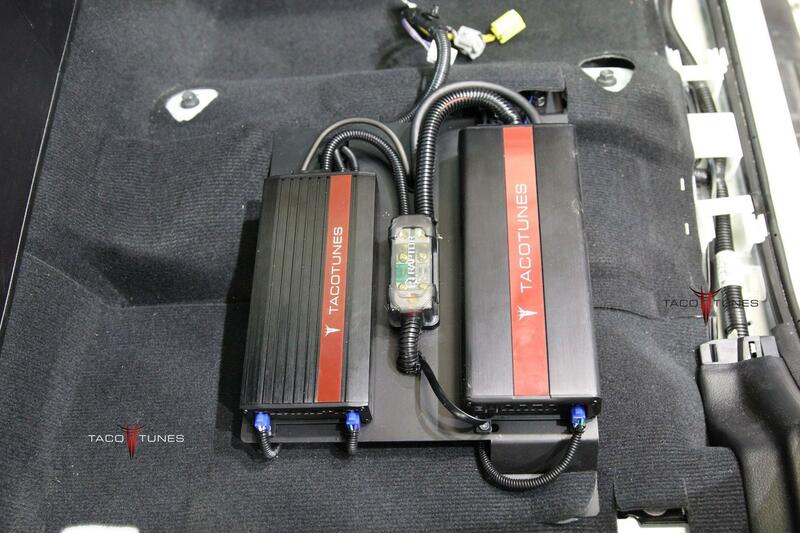 The install is so clean, and looks factory installed-even the newly created harness. They are such perfectionists and extremely knowledgeable. 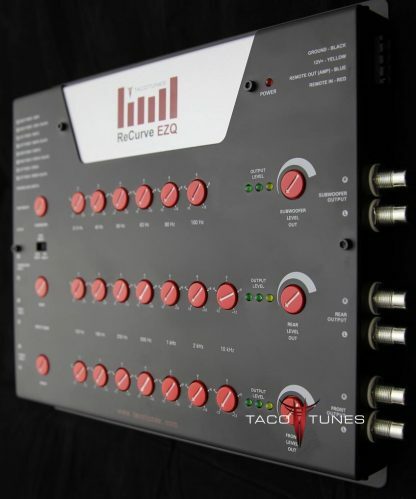 If anyone reading this is considering a new system, then you need to look up Rob at tacotunes.com. Do your homework but you’ll find that TacoTunes is the place to go. 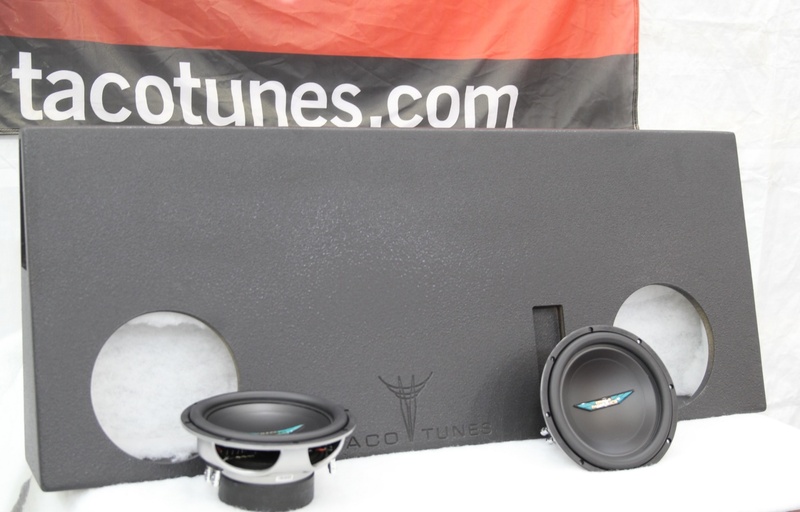 I will definitely recommend TacoTunes to anyone looking. 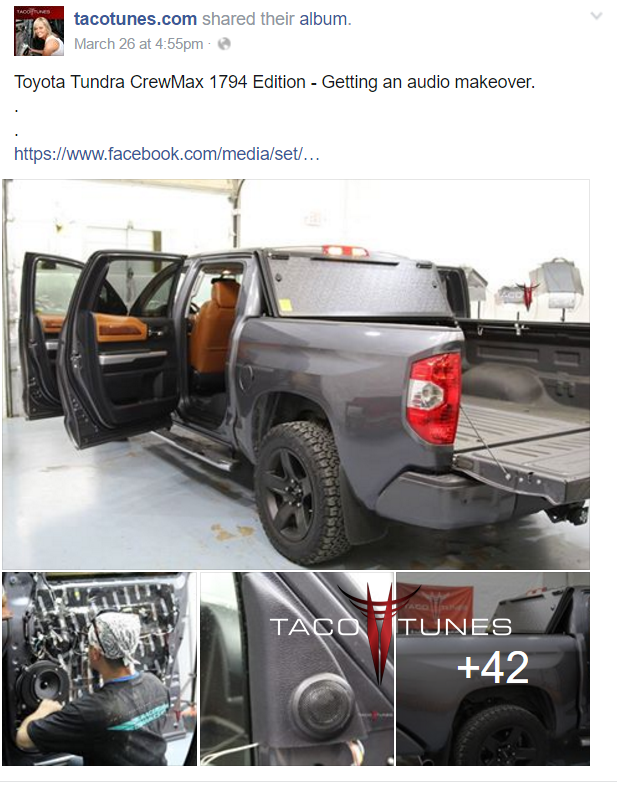 Thanks TacoTunes!! I am one very happy customer. 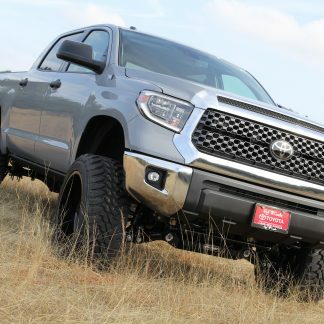 I did a lot of research comparing this system with others available specifically for Tundras, DIY projects in forums and even piecing together a system myself. For the price, this system is better, it comes as a complete package, and has the added support of Rob, Josh and the team. I installed this package myself over 3 days/evenings with some text/email support from Tacotunes. 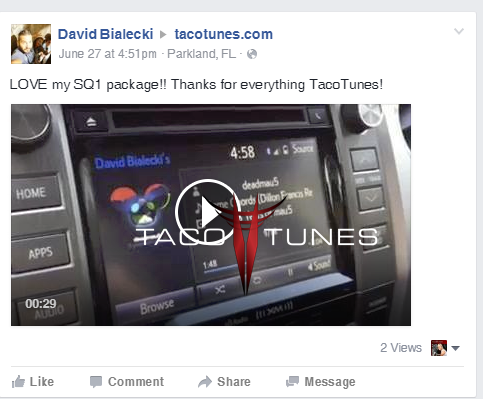 Plus all the great videos and pictures on Tacotunes.com, their Facebook page and Youtube videos. Everything you need and more comes in the package. The sound quality is awesome, exceeded my expectations. I listen to a wide range of music, old school rap, top 40, classic rock, even a little jazz…all sound amazing. Save yourself a lot of time and effort, give these guys a call…or email. Tony, thank you very much! We appreciate you taking the time to write a review! GREATLY appreciated! After spending several days doing online research, I came across tacotunes.com. I loved the installation videos and explanations on different topics. 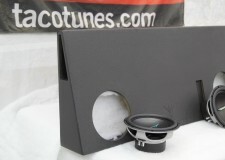 I then went to different blogs and read reviews on their Image Dynamics line of speakers. All good. I ended up ordering their newer SQ1 package. 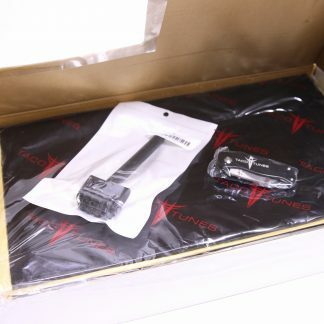 I received everything and made a list of questions before I started the install. They helped me with the majority of the questions to where I felt 100% comfortable with starting the install. I only needed help twice during the install and they were there within 30 minutes to help via text. I had one warranty item and they shipped it to me the next day. Overall I would highly recommend this company based on their expertise, support and products. I now have the best looking and best sounding truck in my crew. Thanks! 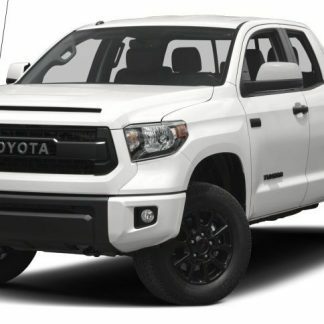 I have a 2016 tundra and just had the sq1 package with 2 12s installed and it’s great! 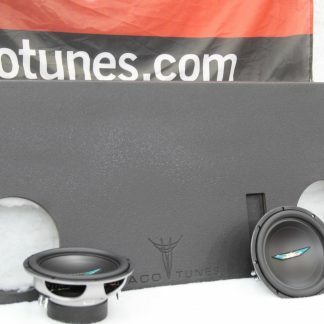 I originally went to here to get them to install some jl audio 10s and some focal speakers with their amp and recurve and it was decent but after hearing this system I had to upgrade! The sound quality is much better than I had before and way louder! They’re really helpful and answered any questions I had as well as keeping me updated. 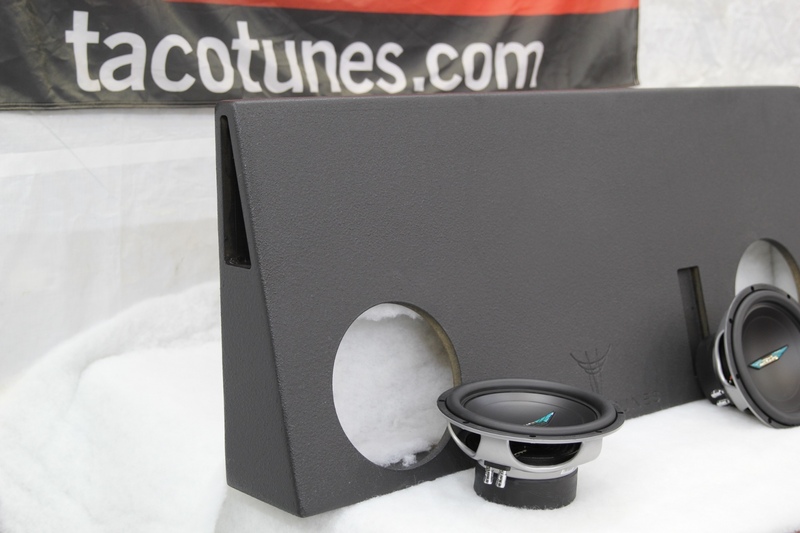 I would recommend this to anyone with a tundra because the sound quality is unmatched to anything I’ve heard yet! Thanks Kelly! You can see Kelly’s install on our facebook page. Way more than expected. You guys rock! Can’t say anything other reviews below don’t say. Other than get one, you will love it. Top Notch! More than I expected in every aspect. 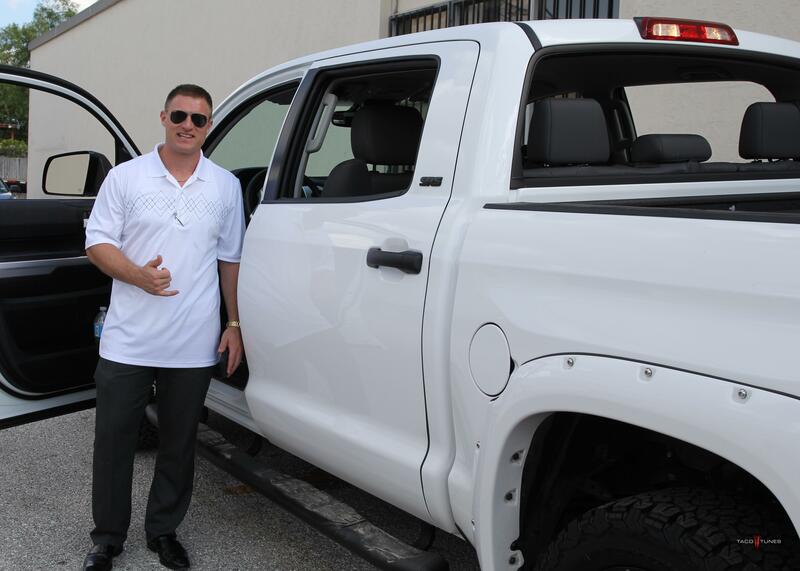 I am a sales manager for a local Toyota Dealership. I have owned MANY cars with many different systems. I have paid MUCH more for much less. This system will blow you away. Image Dynamics speakers are unreal for the money. I have paid much more for speakers that did not perform this well. The sub box is really mind boggling. How are they getting so much quality bass from a small area is beyond me. Buy it, you won’t regret it. Love my SQ1 -thank you tacotunes! F***ing A! Finally a place that knows that F**** they are doing! For years I have gone with big “custom” store here in San Antonio. Always paid for the “best” and now I feel like I was being taken for ride! This is hands down the best system. I have paid 2x and not got half as much. I wish they did other cars, I would have them do my sports car. This system is F****** loud and crystal clear. 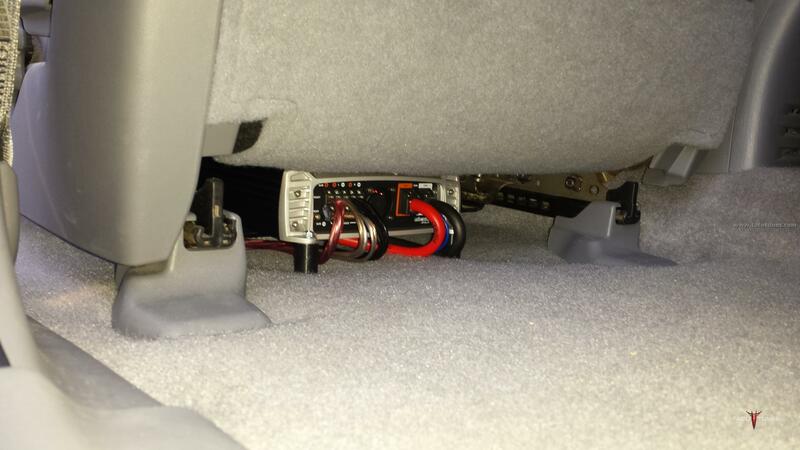 I was blown away by how much quality bass they can get from that tiny space behind the seats. I’m not one to leave reviews. But I do use them to help me shop. The sq1 package is awesome . Compared to some the local high end audio shops here in San Antonio. The price and quality could not be matched. Since I was close to tacotunes.com I was able to meet up with Rob. He helped me fine tune my system . Which I didn’t think could get any better . But WOW Rob is an Audio genius. I cant explain how clean and powerful it sounds now. I highly recommend this product if your looking to upgrade your audio. Once again Thanks for help and putting this system together. tacotunes installed my system. Sounds Awesome! Many stereos over the years, this is by far one of my best systems. You can see Gabriel’s install on our Facebook Wall / Page. Normally I don’t leave reviews but, I feel I’m happy with the SQ1 package so why not share? I would say this is the best sounding system I’ve ever had in any of my vehicles! 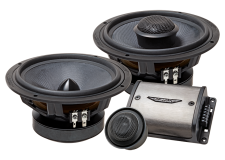 I’ve owned JL, Zapco, Hybrid Audio, Pioneer, and Alpine to name a few. Rob and staff are very friendly. They will give you great sound advice and offer technical help if needed too. I’ve only seen Image Dynamics products in magazines some time ago. Never really seen them in person. I bought this package in pieces so I opted to go with the CXS64 component sets both front and back. Also, I had to put trust in the hands of others being I bought something I’ve never heard before. Image Dynamics delivers amazing SQ/SQL at a margin of the price. 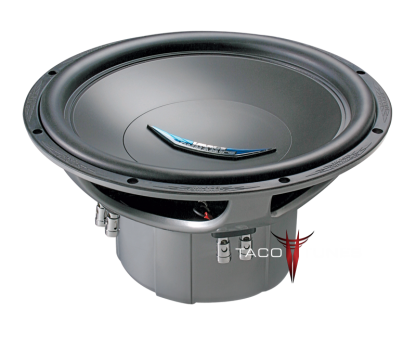 The ID10 V.4 D4 is very well regarded subwoofer and delivers low hertz performance with finesse. 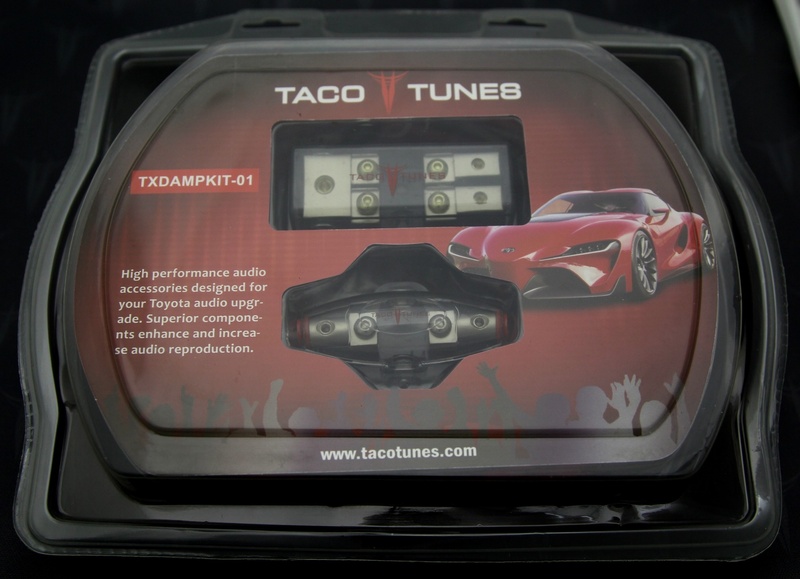 Along with the Tacotunes ported box I’m more than happy. I listen to rock, county, rap, metal, remixes, and oldies to name a few. They all sound great with the all Image Dynamics SQ1 package. It was easy to install, just took many man hours. There was a lot of sweat but, I enjoyed every minute of it and it’s worth it now. Can’t wait for everything to break in because it will sound even better. If that’s possible? 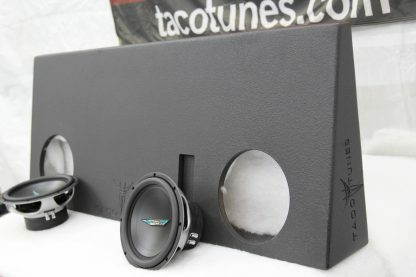 Thanks Tacotunes I’m one happy customer!